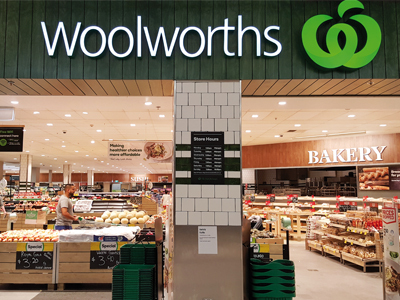 Woolworths Supermarkets has one of the most recognised brands in Australia, with all own in-house and exclusive brands developed and managed by a business unit within the Woolworths Group, Woolworths Food Company, or FoodCo. It includes Australia’s and New Zealand’s leading supermarkets Woolworths and Countdown. They partner with dynamic suppliers to provide a range of own- and exclusive-branded products to meet the ongoing and changing needs of Woolworths and Countdown customers. Their people have a passion for food and non-food, with integrated teams of buyers, developers, quality, welfare and sustainability specialists, customer insights and sensory specialists, chefs, nutritionists and marketers. They all work closely with suppliers to deliver the best mix of quality, taste, innovation, nutrition and value for over 30 million customers per week across Australia and New Zealand. By focussing on its customers and providing, FoodCo aims to maintain a sustainable and competitive offering for Woolworths, Countdown and its supply partners. Clair Stevenson, FoodCo’s general manager for Longlife, and Morgan Oldridge, head of supplier development, have definite ideas about how they see the retail market in the coming months and years. So, what does Woolworths see as the priorities for customers in the coming years and how suppliers can be a part of it? “It’s a really interesting time for retail in Australia,” said Stevenson. “We’re excited to be working at the forefront of the macro trends shaping our customers’ needs and expectations into the future. “It’s no secret that our customers care more about where their products come from, and that presents a huge opportunity for Own Brand to shine through for retailers. We tend to have a greater ability to understand and, importantly, tell the ‘paddock-to-plate’ story to our customers. Whether that’s being able to tell customers about the farming families who supply our Farmer’s Own Dairy products to us, and the long-term relationships we have directly with those families, or the highest quality material and production standards of our Little Ones Baby Wipes. “This need for information supports the trends of health, sustainability, responsible sourcing and animal welfare, all of which underpin what we do in FoodCo and how we approach the design and source phases of our product development process. As the company takes take a more strategic approach to the way it serves customers, it needs a more strategic approach to the way it sources products and invests in its supply chain. It’s in the process now of making significant changes to the way it deals with suppliers and the way it approaches supplier relationships. With more requirements around product sourcing every day, such as ethical and responsible sourcing, animal welfare and sustainability, FoodCo is committed to ensuring it partners with people who excel in that field and can deliver long-term, sustainable competitive advantages to its customers. And how do suppliers get in touch with the right person in FoodCo to talk about Own Brand opportunities? “It’s never been easier to deal with FoodCo,” said Oldridge. “If a supplier wants to get in touch with FoodCo for the first time, simply visit www.supplywoolworths.com.au and complete our introductory capabilities survey so we can capture some basic information about your business. This centralised, secure database will then send that information to the buyer relevant to the category you’re best suited to, and they can be in touch if there’s an opportunity for us to do business together. “If all else fails, send us an email at supplierrelations@woolworths.com.au and we can get in touch to help you along the journey.